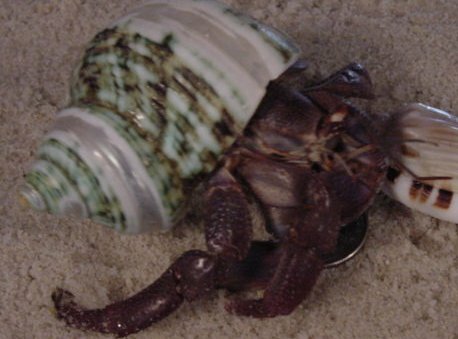 Hermit crabs come in all sorts of colors and sizes. Some of the colors include, orange, purples, reds, peach, blues,and a blend of these colors. It all depends on the type of crab, and from what research I have done , some say it also depends on the crabs health. I am not sure of how true this is, but it could possibly be true that a pale crab is under nourished. This is Ray. My largest Ecuadorian. He is very unique compared to my other ecuadorian crabs due to his vibrant shades of orange, yellow, and brown. This is Lilly. She is somewhat smaller than Ray is, and has a very pretty yellowish color mixed with brown and tan. She is also one of my most shy crabs, yet she is very gentle. This is Marrie. She is our very large Purple pincher crab (or caribean). She tends to be on the purple side, while Red, our even larger Purple pincher is completely red. Marrie is a sweety and she belongs to Christopher, my oldest son. He named her after his Aunt Esther because he got her on his Aunt's Birthday. She is indeed a treasured hermie. Hopefully I will get more pictures up soon of Red, Spark, and Rusty. They are our other larger Purple pincher crabs. The varieties of colors are worth taking a peek at.